Ole’s Ride was held Aug. 23, 2014, in Vergas, Minn. The event raised $10,750 to benefit Hospice of the Red River Valley—the most in its five year history. 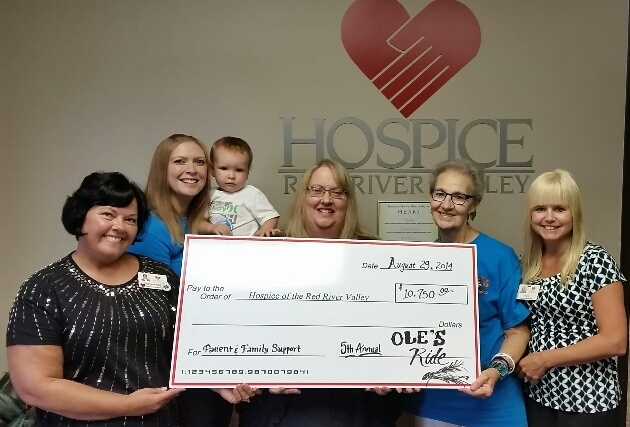 To date, Ole’s Ride has raised $33,650 to help provide hospice care to patients and families in Vergas and the surrounding area. The event started on Friday night with a bike show where riders pre-registered. The ride kicked off from Billy’s Corner Bar and Grill in Vergas, and concluded with a silent auction music by the Fat Cats. More than 65 registered motorcycles and 107 registered riders participated in the 140-mile ride through Minnesota lakes country. In addition, countless people took part in the various events throughout the day, either as riders, volunteers, road guards or other participants.